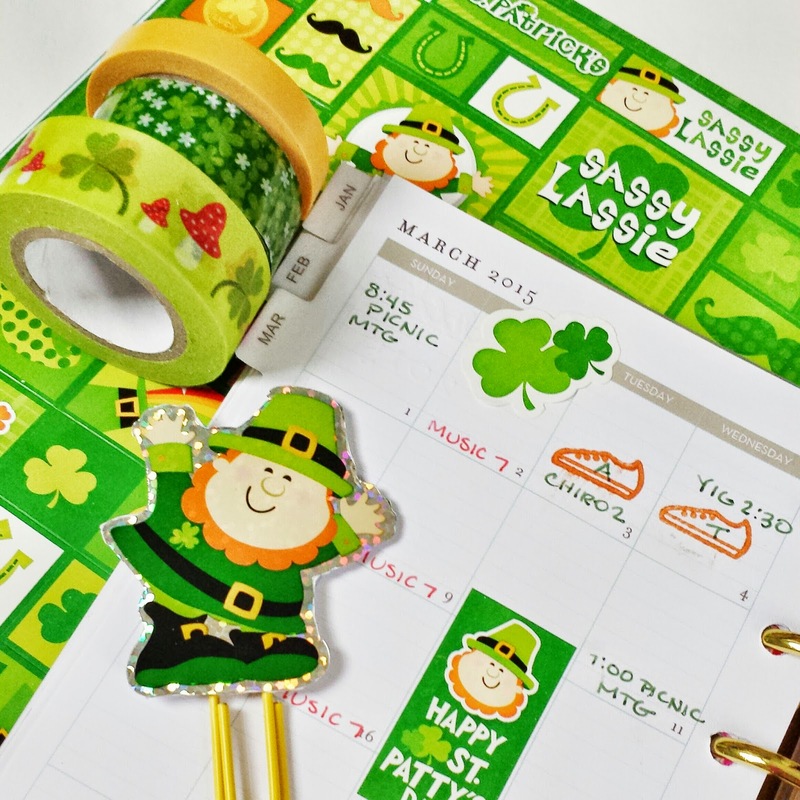 Hi and welcome to this month's blog hop! Are you ready to be inspired by the Gossamer Blue team. You should have arrived from the GB blog, but since this is the first stop, you're welcome to hop from here. March's kits are just gorgeous. They are filled with beautiful pinks, just right for spring! 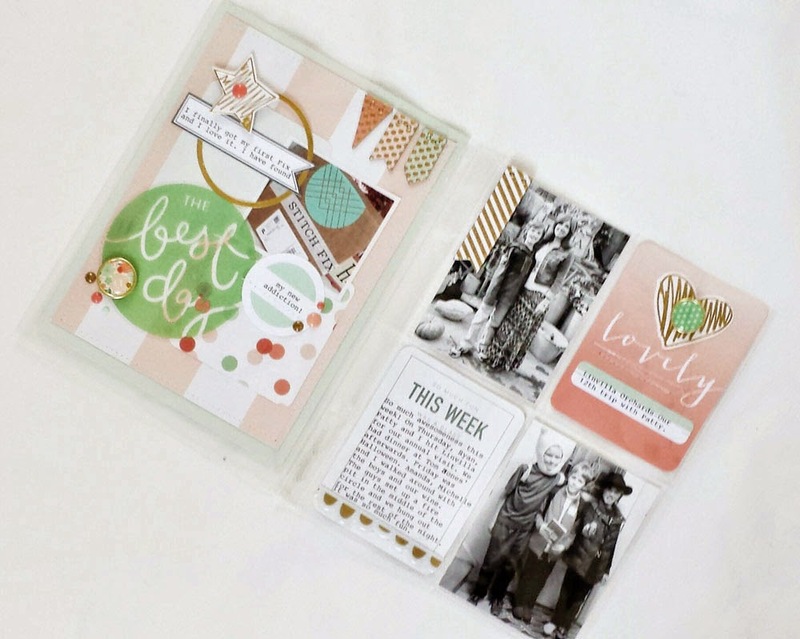 Inside the kits you'll find lots of Pink Paislee, My Mind's Eye and Prinkfresh Studio goodies. For today's hop, I created a couple of cards. These use items from Pink Paislee. I used the die cuts, some chipboard and the little fabric flowers. 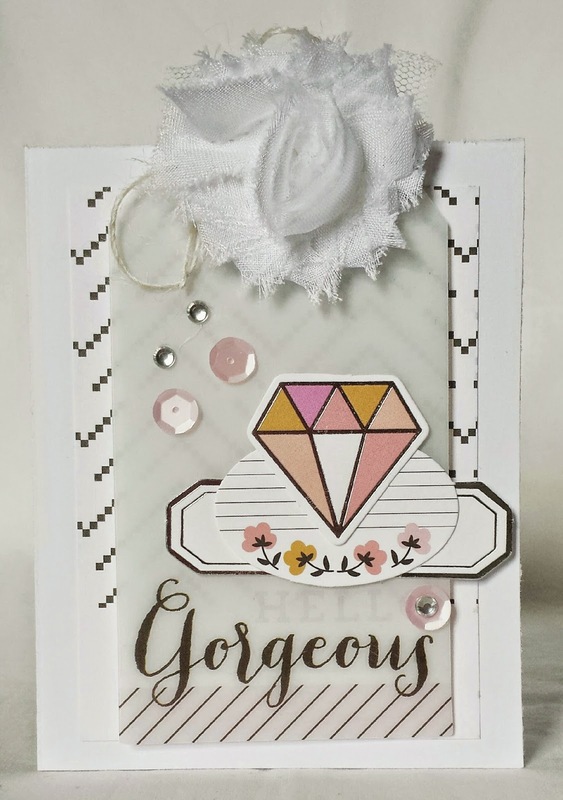 I love white card background and the colors in this line look perfect against it. 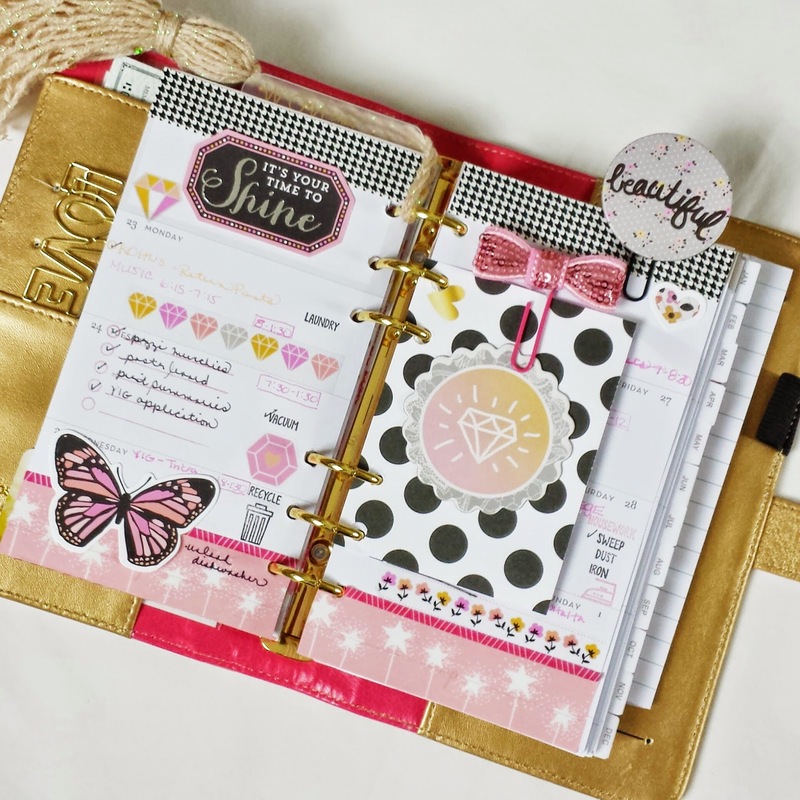 I also have a Project Life spread to share with you. I'm still working on November 2014, so the Gramercy Road line was perfect. except for the one of the fall leaves outside my window. 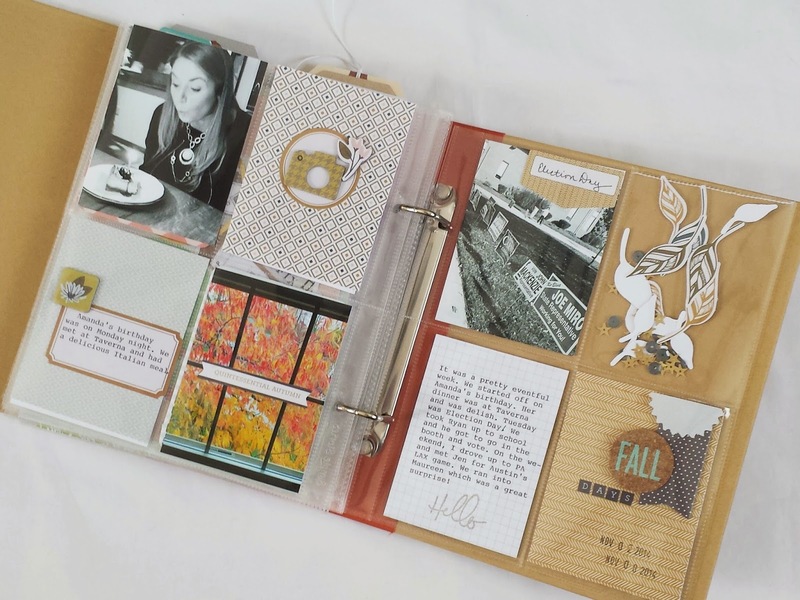 I wanted this spread to have an 'Autumn-y' feel to it. 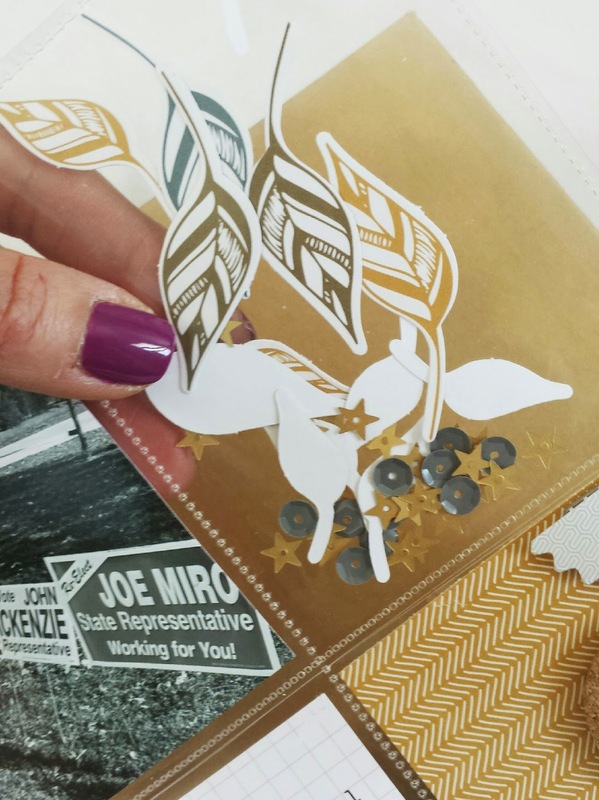 One of my favorite embellishments from the collection is the little leaf die cuts. I created a pocket filled with them, along with some sequins. I love how it turned out. Thanks for stopping by today. I hope that you will continue through the hop and discover the rest of the inspiration that awaits you! I had a lot of fun decorating this spread. 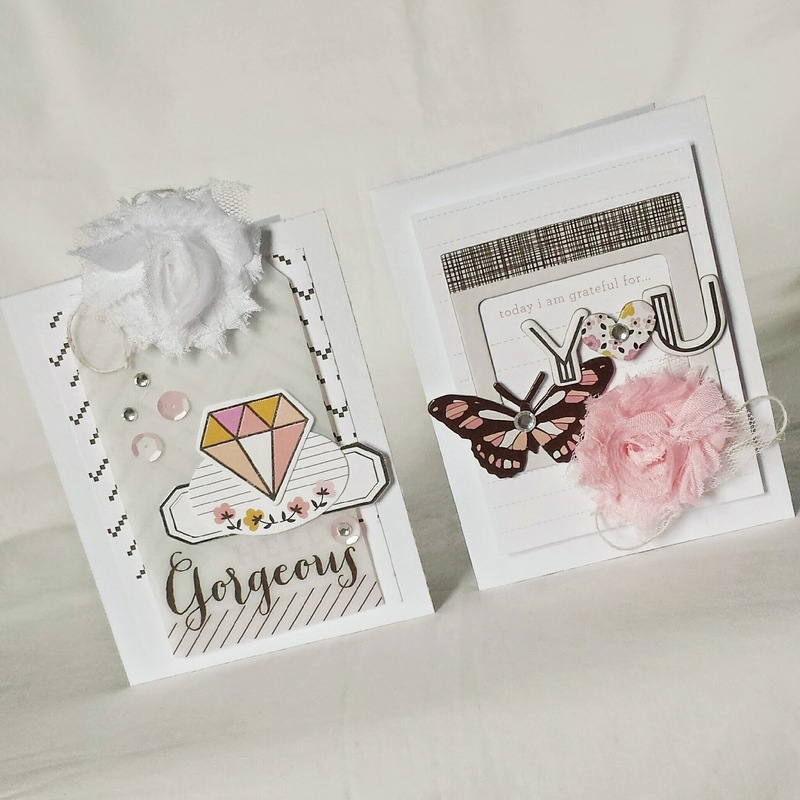 There were several items that I used from my Pinkfresh embellishment kit. I layered some items onto the PL card. I wrote my to do list on the back of it. The little gold flair badge is from there. I hot glued it to the clip. Love making clips right now. The glitter bows came in a Freckled Fawn kit and I made clips out of those as well. For my creative planner, I stuck with light pink last week. This is such an amazing shade! I decorated it with some Echo Park goodies. the stickers are from the Victoria's Garden collection from a while back. The velvet bookmark is something that Webster's Pages out out a while back. I love how it looks here. I used a WP cameo for a clip, too. I'm continuing to use stamps in my planner, too. Really loving the list ones. This one is from Studio L2E. 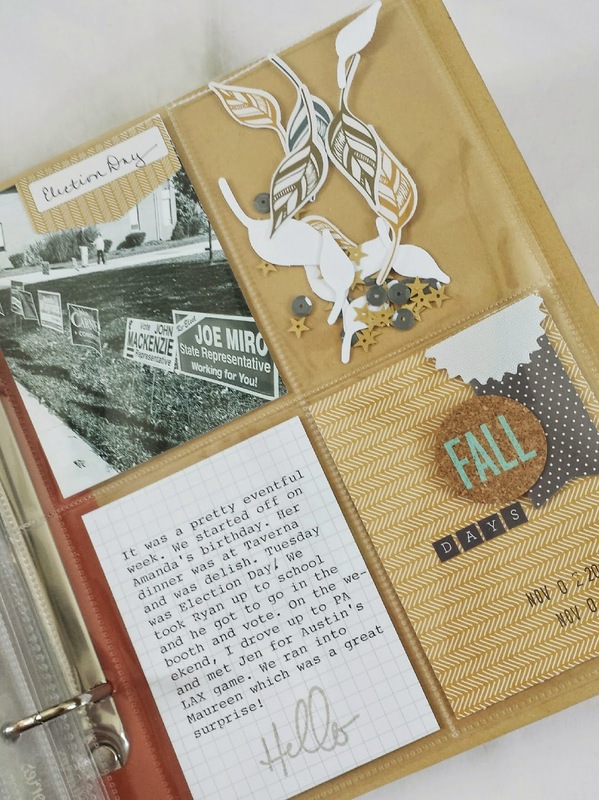 My Webster's Pages teammates Andrea Gomoll and Jennifer Reyes posted a couple of really inspiring videos about using stamps in planners. I got so many great ideas from them! Definitely check them out if you are interested in stamps. 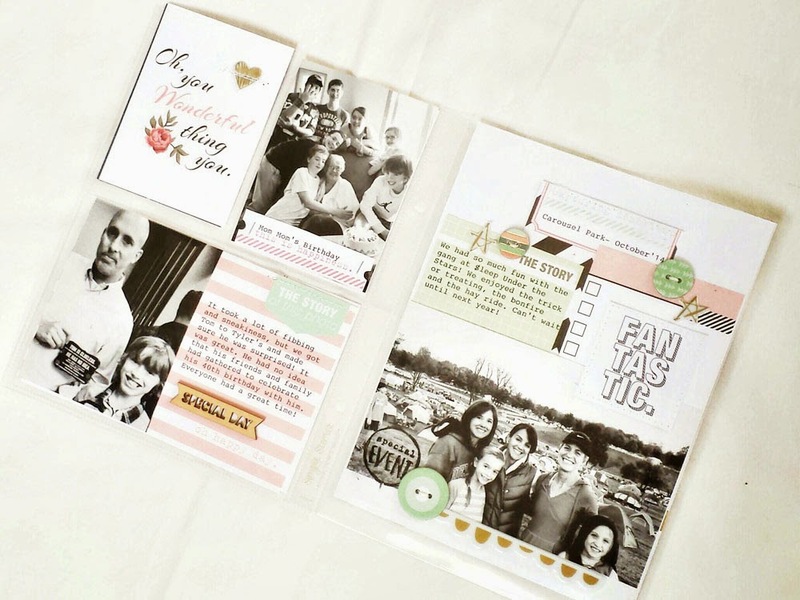 Gossamer Blue March kits are live! As usual, they are amazing. If you love pink, you'll love these kits. 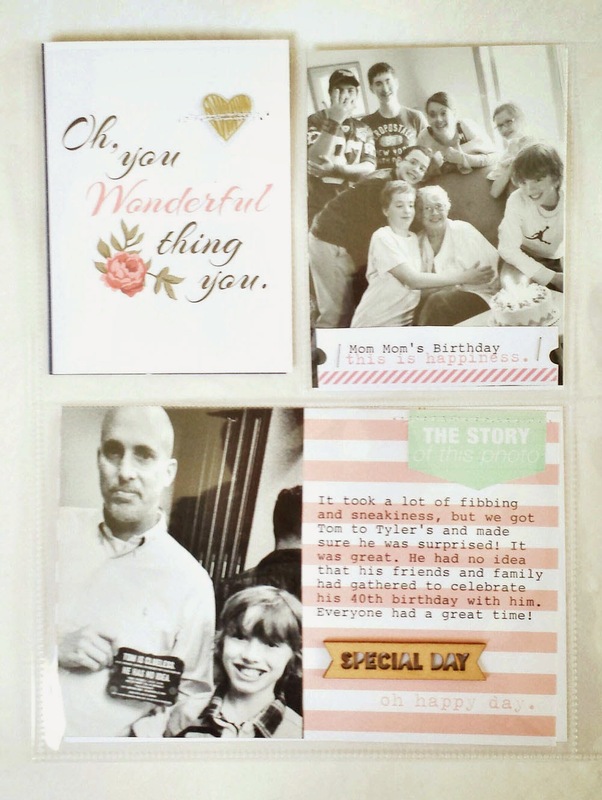 They are filled with Pink Paislee, Pinkfresh Studio, My Mind's Eye, and of course, lots o Gossamer Blue exclusives. Here are my spreads for the month. I am still pretty far behind, these photos are from last October. I am pretty sure that once I finish up 2014, I'll be doing 2015 differently. Trying to capture something for every week has bogged me down. I think I will be selecting different topics and documenting the stories that go with them, rather than trying to capture it all. We'll see how it works out. On this first spread, I stuck with pinks, black and white. I decided that I wanted to do a 6 by 8 page to document our camping trip with friends. 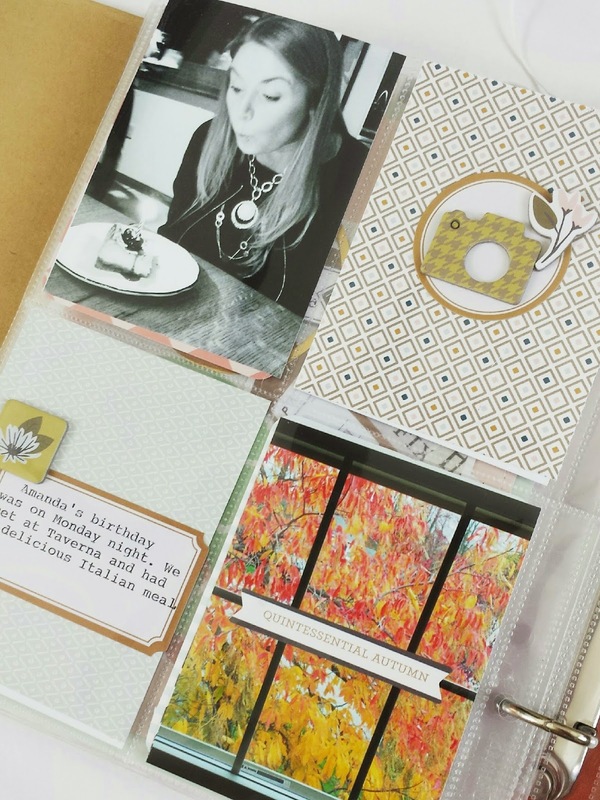 Layering some of the LP cards, along with the photo, helped this page come together quite easily. Sticking with the pinks, I added in more green on this spread. Love the gold in the kits, so I used some as an accent here. Be sure to stop back on the 15th. 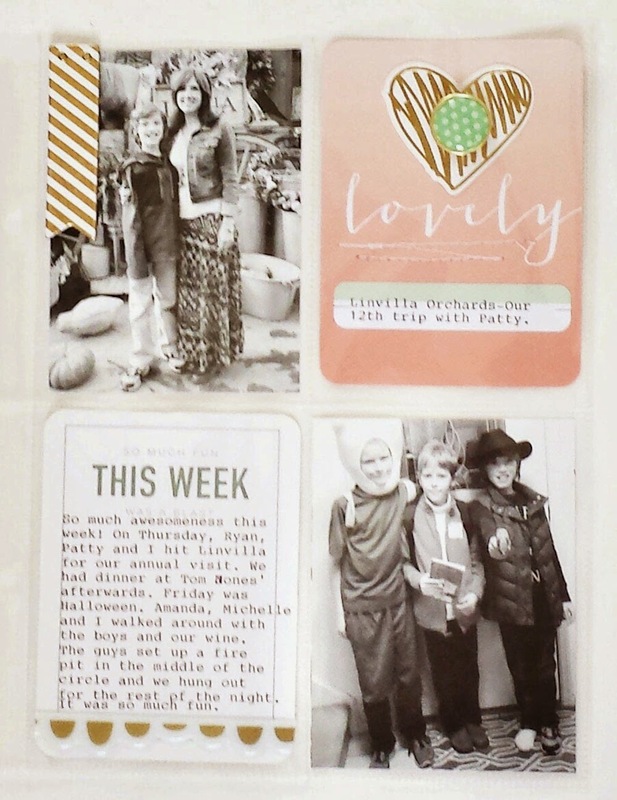 The Gossamer Blue team will be doing our monthly blog hop. I'll have more projects to share with you then! Well, it's March, but it's still winter. I am so ready for flip flops and sun dresses, but Mother Nature has different plans. We had delayed openings for ice on Monday and it looks like a big storm is coming our way today. Make. It. Stop! Today I'm sharing my Gold and Sky Blue Color Crushes. Someone commented last week asking why I use 2 planners. I do it because they serve very different purposes. Here is my Sky Blue planner from last week. 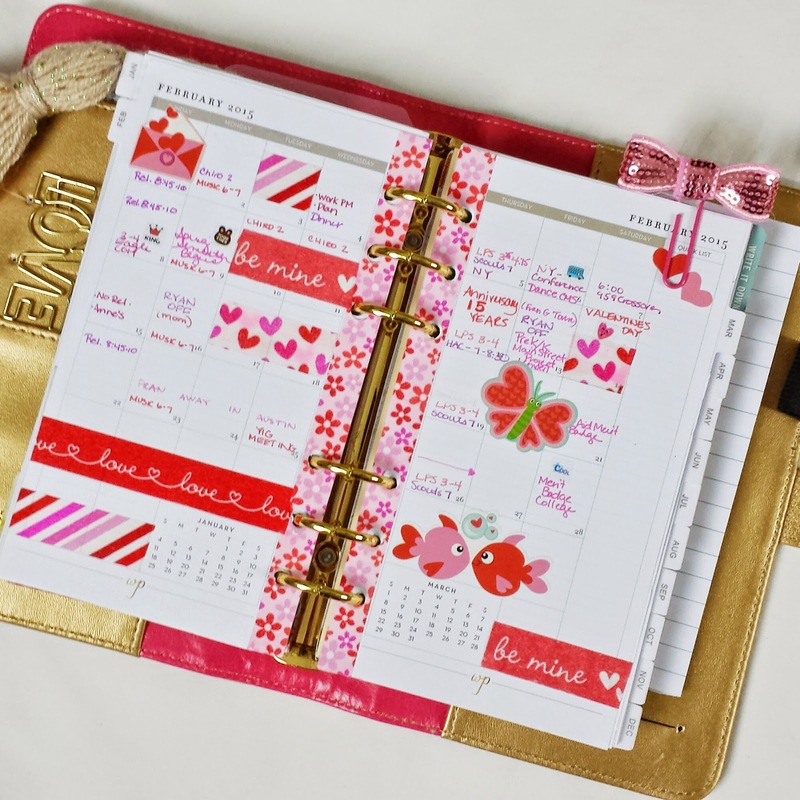 This is the planner that stays on my scrap table. I write down my crafty to do lists in it, I journal a bit about what I've done each day, I keep track of the stories that I want to scrap or include in my Project Life, I add sketches, quotes, etc. You get the idea. This past week I added flowers and butterflies to help make it feel more spring like. I also started using more stamps! So far I'm loving them. 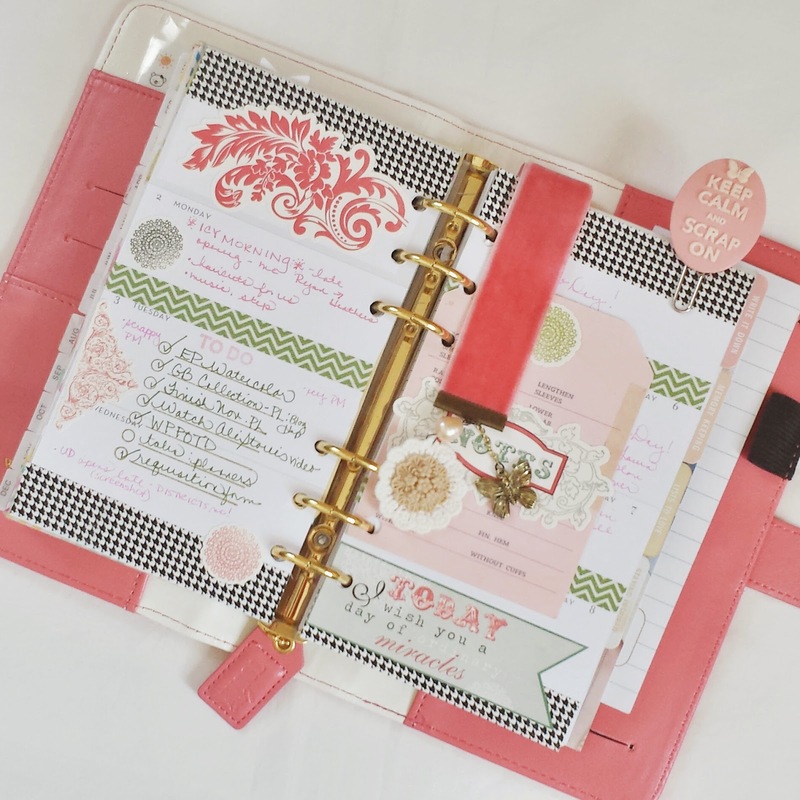 I used planner stamps from Waffleflower and Sweet Stamp Shop. 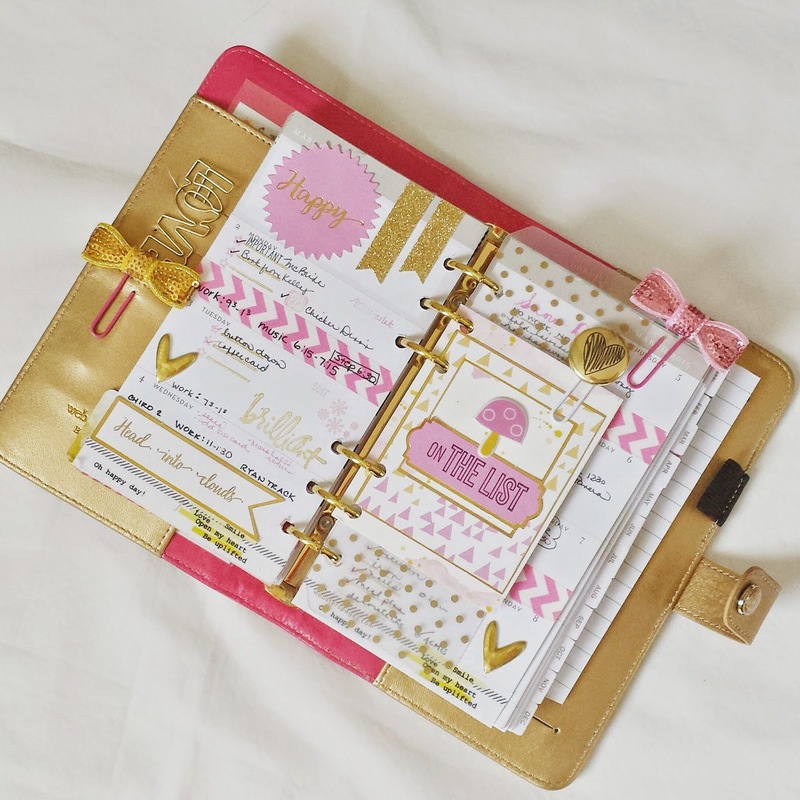 Next up is my gold planner. This is the planner that goes everywhere with me. I carry it in my purse along with my gold folio. (scroll down a bit to see the photo of the two of them together). 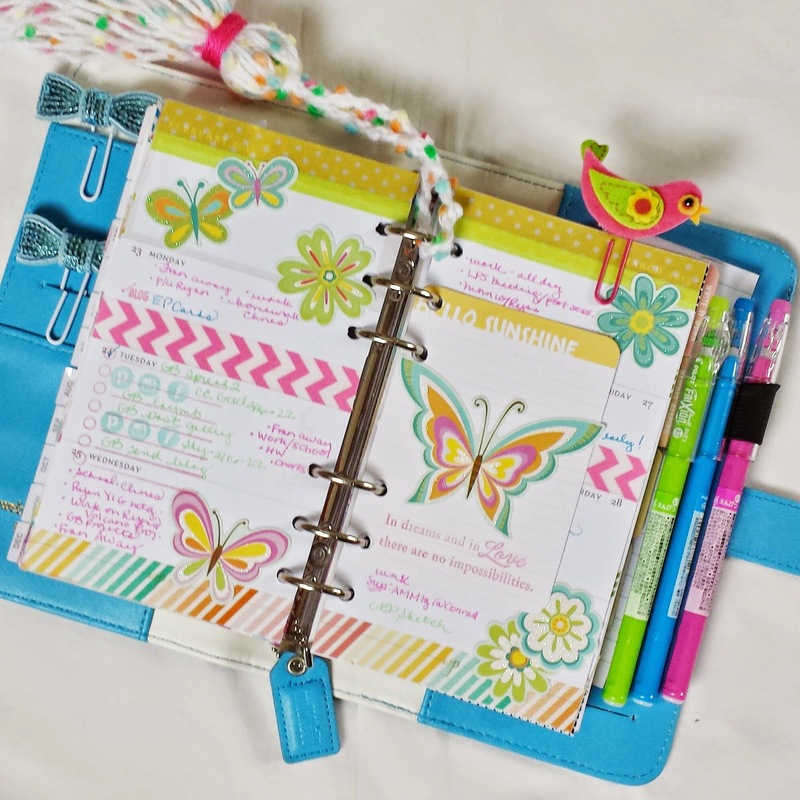 This is the planner in which I write my personal schedule, to do list, cleaning list, meal planning/groceries, etc. I used lots of goodies from Pink Paislee's Rouge collection on here. The 'beautiful' page clip is actually a chipboard piece. I hot glued it to the paper clip. Finally, I wanted to share my February month at a glance page. I hadn't been decorating these before, but decided to do so and love how it turned out! Well. that's it for today. Let me know if you have any questions and thanks for stopping by! 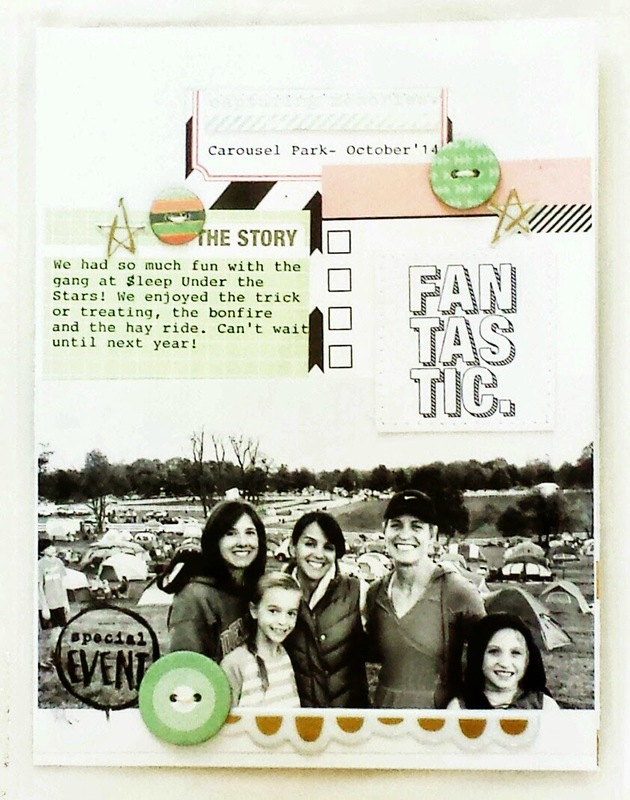 The adorable stamps came in March's Gossamer Blue's Life's Pages kit. I LOVE them. I picked out some more of my favorite goodies. 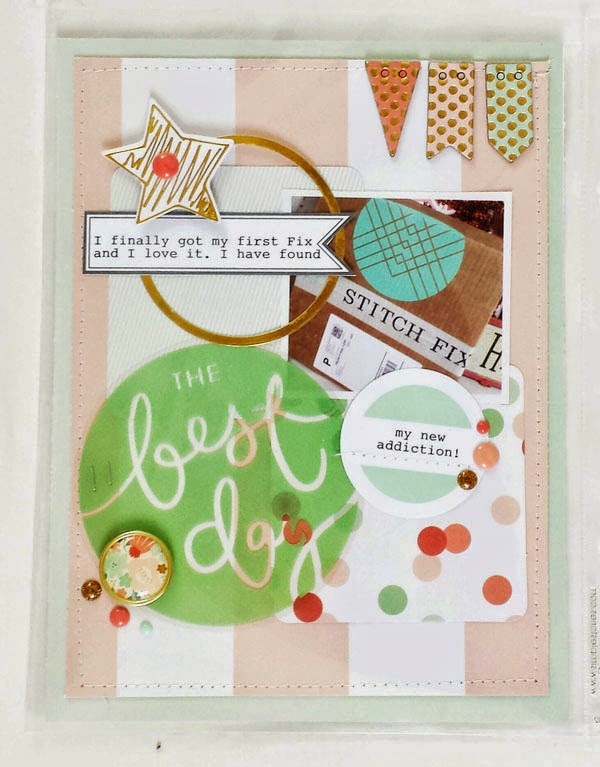 The cloth scrap and gold flair badge are from my Pinkfresh Studio January kit. The stars are Pink Paislee and the washi is Crate Paper. I hung my tag on a basket that sits on my scrap table. It makes me happy just to look at it. 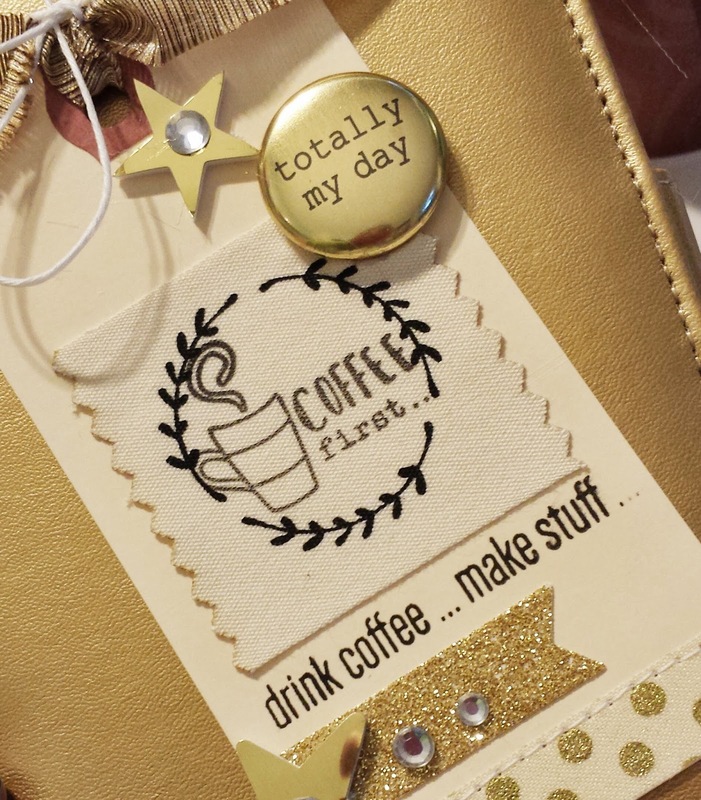 Thanks so much for stopping by and be sure to take a peek at the other projects in the blog hop. 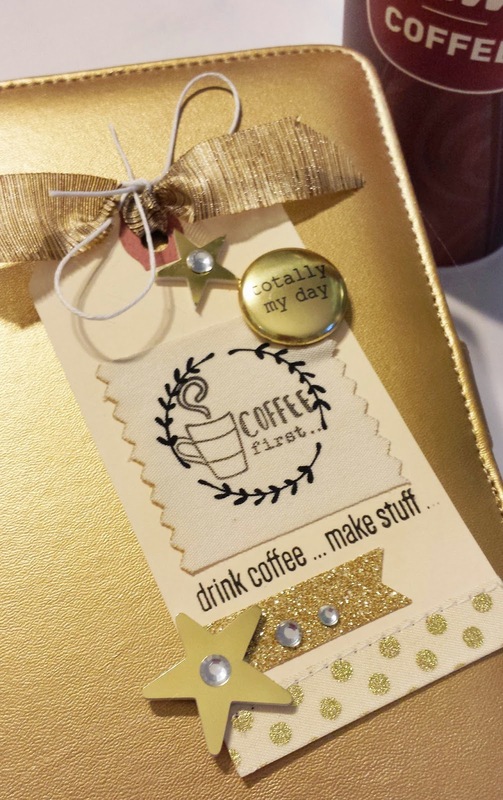 You can find them on the Coffee Loving Cardmakers blog.